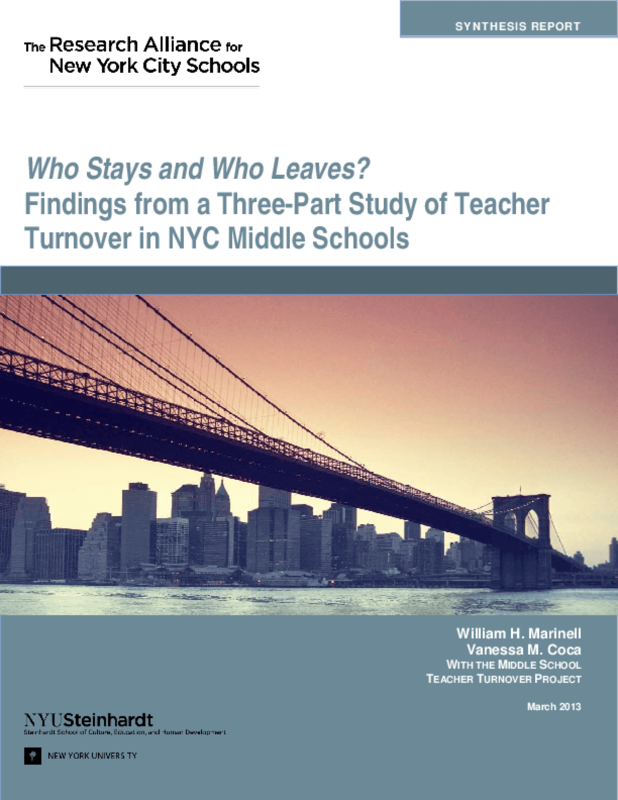 This paper synthesizes findings from the Research Alliance's investigation of teacher turnover in New York City's public middle schools. These years are widely recognized as a critical turning point for students, and the NYC Department of Education (DOE) is pursuing a range of middle school improvement initiatives. The stability of the middle school teaching force has the potential to facilitate or complicate these efforts, yet there have been few studies of the rates and patterns of teacher turnover in the City's middle schools. This study provides the most current, comprehensive look at middle school teacher turnover to date. Drawing on a range of data sources -- including DOE human resource records from the last decade, a survey of over 4,000 full-time middle school teachers, and in-depth case studies in four middle schools -- this paper examines how long middle school teachers remain in their schools, how long they intend to stay, and what predicts whether or not they leave. It also explores how various aspects of teachers' work environment may influence these decisions. Among the key findings: Among middle school teachers who entered their school during the last decade, more than half left that school within three years -- significantly higher than the rates seen for elementary and high school teachers. Of the teachers who leave, most exit the NYC public school system altogether, and only about 1 in 10 transition to another grade 6-8 school. The findings point to several strategies that may be useful for increasing middle school teachers' lengths of stay. Copyright 2013 Research Alliance for New York City Schools, The.